Truvada, also known as PrEP, is an HIV prevention drug that has caused a lot of controversy. The patent for this groundbreaking dug is held by Gilead Scientists. Recently Corey Johnson, speaker of the New York City Council, who is also HIV+, called for the National Institute of Health to break the patent that allows Gilead Scientist to exclusively manufacture and market the drug. The drug when taken consistently reduces the risk of HIV infection by nearly 100 percent. There has been a movement called PrEP4All #BreakThePatent which encourages the government to invoke the Bayh-Dole Act or the Trademark Law Amendments Act. The Act states that a patent can be broken if the government believes that the action is for the greater good of the public. Corey Johnson is now the highest-ranking U.S. Official to join the movement. HIV/AIDS activists believe that the current price of Truvada prevents many people from being able to purchase it. However, Gilead released a statement that through their patient assistance program, many patients can get Truvada for as little as $5. Generic Truvada is available in other countries where the price is roughly $25 per month. Since Gilead has exclusive rights to sell it in The United States, currently one year’s supply is $20,000 or $1,700 a month. In a statement by Johnson, only 8% of the 1.1 million Americans who need PrEP are taking it. In big cities like New York and Miami, Florida this drug is taken mostly by homosexual and bisexual men which means women who are married to HIV+ spouses are not being protected. IBM has a patented e-commerce technology which the company believes Groupon stole and used without permission. It launched a massive lawsuit against Groupon through a Delaware court in 2016, asking for a whopping $167 million to cover damages. The reasoning? IBM said that its technology was important to developing the Internet and could be licensed out to other companies. The tech was never licensed to Groupon. Part of the case was dependent on a couple of IBM patents important to an Internet building block called Prodigy which was built and developed in the 80s. IBM has licensed the relevant tech to companies like Alphabet, Amazon, LinkedIn, and Twitter. The revenue IBM takes from licensing this patent amounts to a shocking $1.2 billion. Of course, none of that came from Groupon. Because Groupon used the technology without paying up, IBM’s bottom line was damaged. The $1.2 billion figure could have been higher. Groupon’s lawyers purported that there was never any evidence of wrongdoing, and requested that a judge dismiss the case. It didn’t happen. The case was ultimately decided when a jury agreed with IBM. Groupon was told to pay an estimated $83 million to cover IBM’s loss. Of course, that wasn’t all. During the settlement process, Groupon and IBM made a deal to license technology over an extended period of time. IBM’s general manager used the circumstances as an opportunity to promote the growth of IBM’s intellectual property licensing, and why not? IBM won. Groupon probably wasn’t happy with the eventual agreement, but the company is certainly pretending it is. Its vice president of global communication, Bill Roberts, acknowledged that the agreement will help ensure that Groupon can continue to provide a wealth of products and services to the consumers who want or need them. Over recent years, the number of IP disputes have continued to increase. In 2001, there were 1557 cases reported. That number skyrocketed to a high of 3074 in 2017. With intellectual property becoming more important, the number of cases will likely continue to go up. As with most things, the Internet is digital. Digital is virtually everything in our world these days, from the worldwide web to computers to smartphones to music and movie files, to entertainment, to appliances – even to fast food restaurants (see kiosks and short-order robots). Nintendo of all companies should have an understanding of this. The Japanese video-game developing firm most known for its game consoles and the Donkey Kong game franchise is learning the hard lesson that its games are digital and thus are subject to being used and duplicated in ways they may not have expected. Now that it knows, the company has filed lawsuits against the operators of a couple of websites that somehow got hold of ROM (read-only memory) files of popular Nintendo games and has offered up more than 50 million downloads to 17 million monthly visitors. Nintendo’s action has already suspended the operation of the two websites, which are claimed by Nintendo to have gained unauthorized access to the TOM files contained inside game cartridges, duplicated them and offered them to people through their websites, which users could then upload to their computer or mobile device and play Nintendo games through what is called n emulator program. This allows people to play Donkey Kong, for example on their smartphone or tablet and skirt around having to pay for a cartridge or uploading something from an app store. These websites are being accused of piracy as part of claims of copyright and trademark infringement, as it is believed that these pirated files are being offered free of charge to any visitor to the sites. This does make one wonder that if Nintendo wins the lawsuits how the company will be compensated other than forcing the shutdown of the websites and ordering the pirated files to be expunged. There is another question about how long this piracy has been going on in that 60 million downloads have been executed, and the two websites have had monthly visitors combined totaling more than 15 million. Has the damage already been done that it’s irreversible? How much potential loss to Nintendo might this be? One thing is for sure, it is cases like this that may tend to bring about discussion as to whether video game companies should work together to develop a sharing platform similar to what is done for music and movies – something called a “freemium” service such as Pandora or Spotify for music, but similar to video games so companies can mitigate the need for piracy and make a little money while offering samples of their titles for the more mobile society where I currently. Needless to say, intellectual-property experts and observers will be watching this case unfold very carefully to see how the industry transforms and adjusts after a sizable threat to its bottom line such as piracy websites. The United States Postal Service (USPS) was ordered by Judge Eric Bruggnik of the U.S. Court of Federal Claims to pay Robert Davidson $3.5 million in damages for copyright infringement. Back in 2010, USPS released a new “Forever” stamp that featured Lady Liberty. Unfortunately, the Statue of Liberty in the image was not the one found in New York but from the replica statue at the New York, New York hotel in Las Vegas, Nevada. The Post Office didn’t realize the mix up until several months later, but due to the fact that they were a best seller continued to print the stamps well into 2014 – selling a total of 4.9 billion stamps. The sculptor Robert Davidson of the replica Statue Liberty argued that the replica is different enough from the famous NYC landmark that it should be classified as an original art piece. “At the time of this replica statues’ unveiling many observers thought the replica was fresh-faced, sultry and sexier than the original”, the suit said. And since the stamp featured the replica’s face Judge Bruggnik agreed. The Postal Service even when fully aware of the error continued to promote and sell the stamps. A USPS Spokesperson was reported saying on CNN back in 2011, “We really like the image and are thrilled that people have noticed in a sense. It’s something that people really like. If you ask people in Vegas, they’re saying, ‘Hey that’s great. That’s wonderful.’ It’s definitely injected some excitement into our stamp program.” A USPS Spokesperson also told The Washington Post in 2013 that the office would have chosen the image anyway even if they were aware of the error when first published. It’s a sad day for Odessa, Texas. Creating art is difficult. Art is your baby and when you see other people attempting to recreate or steal your art, it hurts. Such was the case for French Artist Orlan. Back in 2013, Orlan filed a claim of intellectual property infringement against pop-singer Lady Gaga. 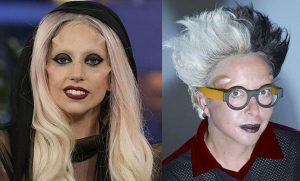 Orlan claims that Gaga drew inspiration from two of her characters from previous art videos and used them in her Born This Way music video. In the end, the court did not rule in Orlan’s favor. French law states that artistic ideas are not allowed to be copyrighted but does offer some protection of key concepts and innovations. Orlan claims that Gaga used her imagery to ride off her coattails – a term in French called “parasitisme”. The court ruled that the artists occupy different spaces and there is no confusion between Orlan and Lady Gaga (when Lady Gaga was asked about Orlan she replied, “Who’s Orlan?”). The court also stated that Lady Gaga did not benefit in any way from a casual association with Orlan. Orlan also failed to provide any evidence that Gaga sought to take advantage of Orlan’s creations. What do you think? Do you think the courts in France ruled correctly? Hey Knock-Offs! Knock It Off! It isn’t the first and won’t be the last that the Brits and Americans get into an ugly battle. While this might not be on the same level as the Revolutionary War, this legal battle without a doubt is tumultuous. 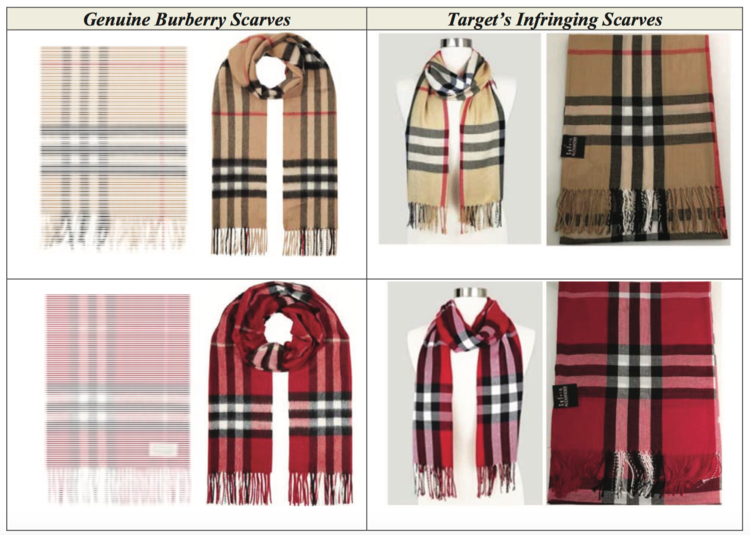 Burberry claims that Target’s scarves are of an inferior quality to that of their own brand adn will ultimately cause confusion amongst customers and customers will likely be misled to buy unauthorized Burberry products. Burberry also claims that since Target has a reputation of collaborating with fashion designers, it’s not difficult to confuse consumers that these are Burberry products. For more information the case is Burberry Limited (UK) et al v. Target Corporation et al, 1:2018-cv-03946 (SDNY). It is no exaggeration to say that the magnetic stripe card transformed the world of retail (and financial services). The inventor of the technology, Ron Klein applied for a patent on the technology way back in 1966 – and today he is frankly amazed that the technology has been around for so long. However, when he invented the technology in the mid 1960’s the concerns that he was addressing were slightly different from the concerns of today’s world. Yes, fraud was an issue, in those days clerks were handed a book of cards that were linked to fraudulent transactions. They had to manually check to see if the card presented by the customer had not been used for any of these transactions. This slowed the checkout time considerably and led to enormous customer frustration. Klein wanted to automate the system so that salespeople could simply key in a number and get a result – but he thought further than that – what would happen if a computer could read the card itself? He had tried a number of ways to get the magnetic strip to adhere to the card – but all eventually led to the degradation of the strip – which then became unreadable. He eventually took a variety of glues and other adhesives home with him one evening to continue work. He explained the problem to his wife who had been ironing that day – she suggested ironing the strip onto the plastic card – and this worked perfectly, the heat from the iron was just enough to form a perfect bond between the plastic and the magnetic strip. Klein patented the idea in 1969. But another company, IBM was working on a different angle. The designers at IBM did not even bother to patent the magnetic strip idea – they wanted to capture the market for the computers and readers of the strips – and the idea paid off handsomely. An engineer for IBM when interviewed in 1990 said that for every dollar that IBM had invested in the strip technology the idea of supplying the background technology of computers and readers had returned $1,500. The magnetic stripe technology transformed financial services and the retail experience in the United States and later elsewhere in the world. Consumers could quickly and easily make purchases and just as easily fall into debt. By 2016 consumer loans and other credit debt stood at $3.5 trillion. What Happens To Your Patent When Your Business Dissolves? If you own a medical malpractice business and have a patent, you are probably wondering what happens to your business patent after your company is dissolved. After all, your patent is an important part of what you do. If you lose your patent, you might not be able to stay in the same line of business and your entire future could be ruined. Read on to learn about what happens to your patent when your company dissolves. The patent creator usually assigns the patent to a company. When a business dissolves, the assets of the company are going to be distributed. If your company already had the patent prior to the company being dissolved, then the patent goes back to the original creator. If you created the patent and registered it and the company was yours, then you will still own it. The patent always stays with the creator always. A simple way to look at it is that a patent is assigned to a person, not a business. The person can then assign their patent to a company or corporation. This turns the patent into an asset of the company. However, if the company dissolves the patent just reverts back to the person who assigned the patent. Things can get complicated when a company dissolves and there are so many legal matters that have to be attended to. Things can be difficult to sort out which is why you are going to need legal help when your company is being dissolved. You are going to want to make sure that everything works out the way it is supposed to and that you are able to dissolve the company in the right way. The patent is likely to be a big company asset so it is important that the patent gets taken care of the right way. When you dissolve a company you are going to be going through a difficult process. It is important to make sure that the patent issues are taken care of. When it comes to the patent, you can’t have any ambiguity. You must get the patent back to the proper person once the business is being dissolved.